This is the best Paleo carrot cake recipe! It’s made with maple syrup instead of sugar plus it’s gluten-free and healthy and clean eating. When I was pregnant with my first child, carrot cake was my craving of choice. I was like a carrot cake junkie! Anywhere I went I just had to have it. I wasn’t on any diet restrictions back then, so I went so far as to buy those little cake squares at 7-11 – it was quite the craving. To this day, carrot is my FAVORITE cake. I mean, really, what’s NOT to love? The moistness, the carrots, the raisins, the cinnamon, the thick cream cheese frosting (I’m drooling already!) But guess what? A slice, ok, ok, 3 slices of carrot cake when pregnant is just fine, in my book anyway. So, what about now? I can’t dive into a moist delicious, Über fattening piece of carrot cake because although it makes my heart skip a beat, my waist is like “No way LADY! Red Alert! Red Alert!” what’s a gal to do? Well, if you’re anything like me, and your mind works like mine, then that’s super scary and you’ll also have come up with some way to indulge without all that added fat! Right? RIGHT??? I’ve come up with my tried and true recipe for the best Paleo carrot cake you’ll ever indulge in all the while being good to your waistline, and hips, and anywhere else you gain weight. Yes, I love you, too! I came up with this recipe when I wanted my favorite birthday cake (carrot), but I was on the Paleo diet and knew my old recipe just wasn’t going to cut it. I’m glad I tried this because I love it – and I don’t feel bad after eating it. HUGE bonus! I would love to know what you think of this Paleo carrot cake recipe, especially if you miss the cream cheese frosting that’s in traditional carrot cakes. Please comment below! 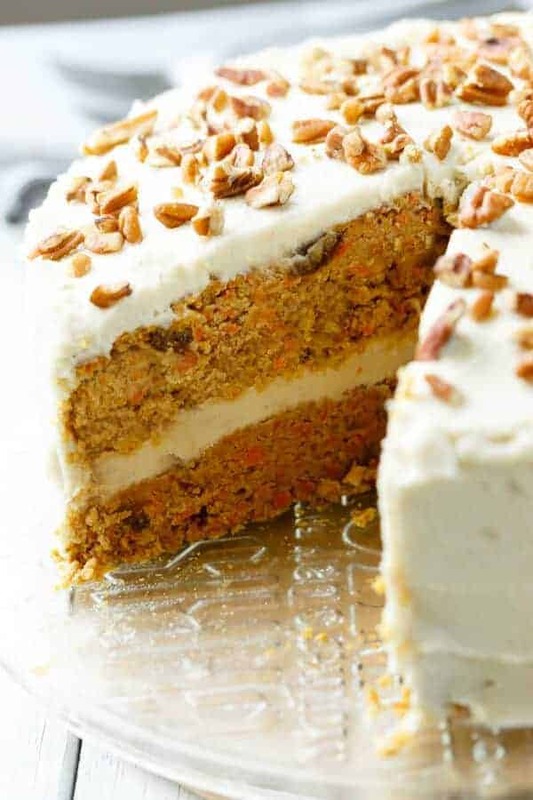 This Paleo carrot cake with maple syrup, carrots, raisins, cinnamon, and a thick “cream cheese” frosting is not only delicious, but healthy too! Stir the shredded carrots and raisins (if using) together with the maple syrup and refrigerate for one hour. Heat the oven to 325. Grease two 9″ cake pans with coconut oil and dust with coconut flour, line the bottoms with circles of parchment paper cut to fit and set aside. If using a Bundt pan, grease and flour as described and set aside. Combine the coconut flour, cinnamon, nutmeg, salt and baking soda. Crack the eggs into a large mixing bowl and beat with an electric mixer until combined. Add the pumpkin puree, vanilla, coconut oil and orange zest (if using) and beat until well combined. Fold in the dry ingredient mixture until just combined. Fold in the maple syrup/carrot mixture until evenly combined. Divide the batter between the cake pans, or pour into the Bundt pan. Bake 35-40 minutes in cake pans, or 1 hr and 20-30 minutes in Bundt pan. Cakes are done when a toothpick stuck in the center comes out clean. Let the cakes cool completely before removing from pans and frosting. Loosen the cakes from the sides of the pan with a knife for easier removal. Place the cashews in a heat-safe container and cover with boiling water. Let stand 20 – 30 minutes, then drain and rinse with cold water. Drain again to remove as much water as possible. Transfer the cashews to a food processor and process until they’re broken down into a paste. Add the remaining frosting ingredients one at a time, processing well after each addition. Continue to process until the mixture is very smooth. Add a tablespoon or two of your favorite paleo milk if the mixture is too thick. Transfer the frosting to a freezer-safe bowl and freeze about 30 minutes. Remove from freezer and beat with an electric mixer until the frosting begins to thicken. Return the frosting to the freezer for another 30 minutes. Remove and beat until thick. At this point, the frosting should thicken quickly. If it’s too thick to spread easily, let it sit out at room temperature until it softens slightly. Frost the cooled cake as you like. Use plenty of frosting between the layers for a tall, beautiful cake. After I changed to a Paleo diet I really missed carrot cake so I went in search of good Paleo carrot cakes and I found 9 of the Best. I did that because I LOVE carrot cake but when I started eating Paleo I thought I would never be able to eat it again. I thought there was no way to replace the cream cheese frosting that makes carrot cake what it is. Well, I was wrong again. I found some really good paleo carrot cakes recipes and several have great “cream cheese” frosting recipes included. 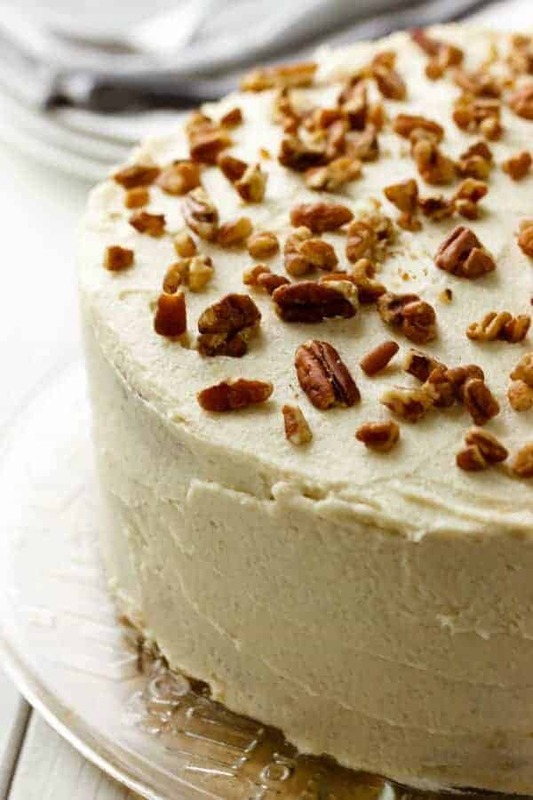 Most of the cream cheese frosting’s are made with cashews or coconut cream, I love my cashews too, so I can’t go wrong. I didn’t include any raw Paleo carrot cakes recipes because I think they are just weird. There is no way they can even be close to the same except that they have carrots. Whoopty Doo, that doesn’t impress me. It has to have some flour of some sort in it, in my opinion, to be called a cake. Plus it has to have a frosting of some sort. I may be old fashioned, but that’s just how I feel. What do you like in your carrot cake? What do you not like in it? I hope you enjoy these. This is AIP compliant besides being Paleo. That’s why it calls for gelatin eggs instead of eggs. It could be fun to give them a try. It is topped with toasted coconut flakes and a whipped coconut milk frosting. If you’ve never tried Tigernut flour, you really should. You can learn all about it in this post. Paleo Tigernut Flour Recipes Index, Pros, Cons and Best Prices. This is a traditional carrot cake made with coconut flour and maple syrup. It has added golden raisins and pineapple which helps moisten it up. It has a maple pecan glaze on top with chopped walnuts. If you don’t like “cream cheese ” frosting, this is for you. What is a carrot cake all about anyway? It’s about a basic cake with an array of spices and textures and of course flavors. Look at all of the different spices in this recipe. Then look at all the textures with nuts, raisins, pineapple, and carrots. Maybe your taste buds will explode with all these different ingredients in here. For frosting try making this whipped coconut cream. Coconut flour can give baked foods a different texture than other flours. This has a really fluffy light texture. It’s kind of like a cross between a sponge cake and a regular carrot cake. It is a light alternative for say an Easter dessert. It is lower in carbs because coconut flour isn’t carby but is high in fiber. Plus it has a lot less oil than a traditional cake. 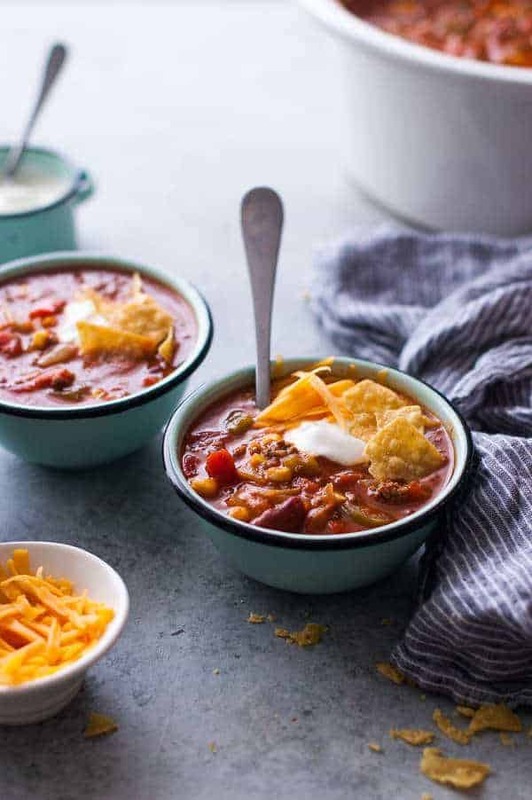 There as so many positive aspects to this recipe. Besides the facts that it’s gluten-free, dairy-free and Paleo. It is packed with protein, it’s healthy and best of all, it’s mixed in the blender. Something that I find interesting about carrot cake is that some have raisins, pineapple and shredded coconut added to them. Others don’t, so it seems to me that you can pretty much make a carrot cake what you want it to be. Now, you won’t find any raisins, pineapple or shredded coconut in here. What you will find is a lot of walnuts. The best part about this is that it is sandwiched and topped with coconut cream. You could use pecans if you’d like. Either one would be delicious. I like the crunch the nuts add and the creaminess of the frosting. Two completely different textures. So what do you like in your carrots cake? Do you like it with raisins and pineapple and coconut? I’ll tell you right now what I love about carrot cake, and it’s everything EXCEPT the pineapple, coconut, and raisins. I think they ruin it. What I miss the most about the traditional kind is the real cream cheese frosting. I think that’s why I liked carrot cake. But whipped coconut cream or cashew cream is good too. My carrot cake story is that my mother never heard of it until she got married and her sister in law made it. My mom instantly fell in love with it and has never stopped loving it since. How could my Grandma have never made a carrot cake, I don’t but she didn’t. Now everyone in our family loves it. Several of my siblings ask for it for their birthday. We get to choose what kind of cake we have for our birthday party. Can you sub the maple syrup for honey? Looking to cut back on the sugar! I supposed, but it would be like subbing white sugar for brown sugar and would change the taste and you would probably need to use a different amount. A Google search could tell you the difference. Another thought is that you could probably get away with use less of the maple syrup, although that would change the moisture content of the cake. . .
I’m looking for a good Paleo Carrot Cake recipe. I see this one has Pumpkin in it. 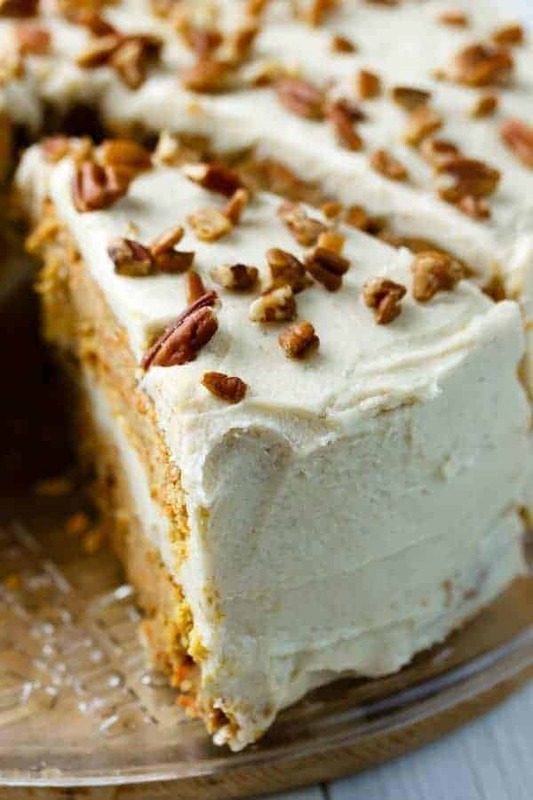 Both my husband and I hate anything pumpkin, so can you tell me if the flavor of pumpkin comes through in each bite, or is it absorbed so the cake doesn’t have a pumpkin taste? The recipe sounds awesome until I get to “pumpkin” so thank you for your advice. Hum. I don’t think it’s very pumpkin-y, but I like pumpkin things, so I’m probably not the best person to ask. It does have a pretty decent amount of pumpkin, but not as much as carrots. Can I use apple sauce instead of the pumpkin? If yes, what quantity? I’m not sure. I haven’t tried it. The consistency isn’t quite the same so I couldn’t tell you without testing it myself. Sorry I’m not more help. Looks really interesting, planning to make this tomorrow. I don’t see the amount of raisins that are needed. Can you tell me how much you used? Thanks! Honestly I probably put a different amount any time I make it. I kind of just eye the amount depending on who will be eating it. Some people really don’t like raisins and so I will put in less but if you like more go ahead and put more. It is all preference and it won’t make a difference to the recipe taste. I may have just missed it, but, how many eggs does this recipe call for? Looks sooo good! Alright, looks like part of the ingredients got accidentally taken off. I was able to fix the problem so it should be good now. Thank you for letting me know about that error. It was appreciated! I have tried a lot of coconut flour recipes but havent had a carrot cake before with coconut flour. I am definitely trying this. recipe takes much longer in a bundt pan at 325F So far its’ been in for 60 minutes and still wasnt done. In for another 30..here’s hoping! smells amazing though! Texture was perfect! Can hardly wait for the finished results! done in a bundt pan a@ 325F for 1hour 20 minutes. Do I strain/drain the carriots from the marinade prior to fooling in? Wow…I used this recipie to make mini muffins. We had 72 amazing mini muffins. This is an excellent recipie and it is going in my binder. Only the best of the best go in my binder. Thanks for sharing this…. I have never heard of Carrot Flour but I can tell that is must be great. This cake is gorgeous! Do you mean carrot flour or coconut flour? Coconut flour is a very popular grain-free ingredient. I love this recipe, it looks amazing. 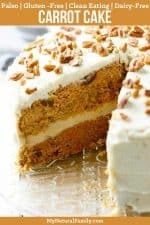 My husband’s favorite is carrot cake, so I think he will LOVE this! Thank you! This looks like a really great recipe! I can’t wait to try. The rosettes are gorgeous. Doesn’t it look so good? Please let us know how it turns out . . .